April 2015 was the 150th anniversary of the Appomattox Court House surrender. On August 19th we played for the “Return of the Troops” when the Minnesota Second Regiment came home up the Mississippi by paddle wheel steamboat to Fort Snelling. The Manitou Regimental Brass Band is now decommissioned and the musicians are dispersed. Contact the Vintage Band Festival about any veterans groups that may develop in the future. 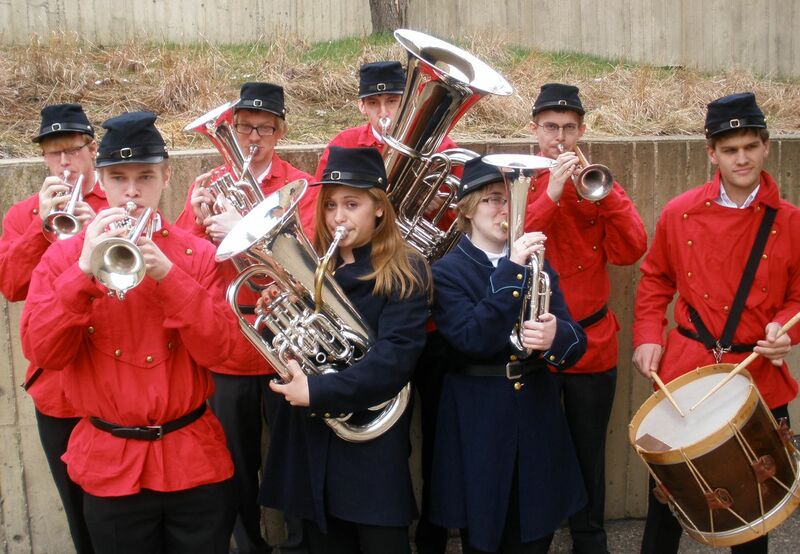 Brass playing students from St.Olaf College in Northfield, Minnesota have converted their Scandinavian style brass band into a revival of the small seven piece brass bands that played during the War Between the States. In observance of the 150th anniversary of the War they are appearing at conferences, reenactments, festivals, and other commemorations. They are also available for concerts or other special musical presentations. Contact vintagebandfestival@gmail.com for more information.